Update 2/14/2019: Official confirmation of Assassin’s Creed III coming to Switch has been provided! Announced as part of yesterday’s Nintendo Direct, the game will be making its way to the Switch on May 21, 2019. The bundle will include Assassin’s Creed III, all previously released DLC and Assassin’s Creed Liberation. A couple weeks back I covered a rumor suggesting an Assassin’s Creed III remastered collection could be coming to the Switch. The collection would pair together both Assassin’s Creed III and its PlayStation Vita spin-off Assassin’s Creed III: Liberation into one convenient remastered collection. The collection has previously been confirmed to be coming to PS4 and Xbox One as part of the Assassin’s Creed Odyssey season pass but, the fate of the Switch version was never made certain. Today however, it seems that we may have finally received confirmation that the collection could indeed be Switch bound. 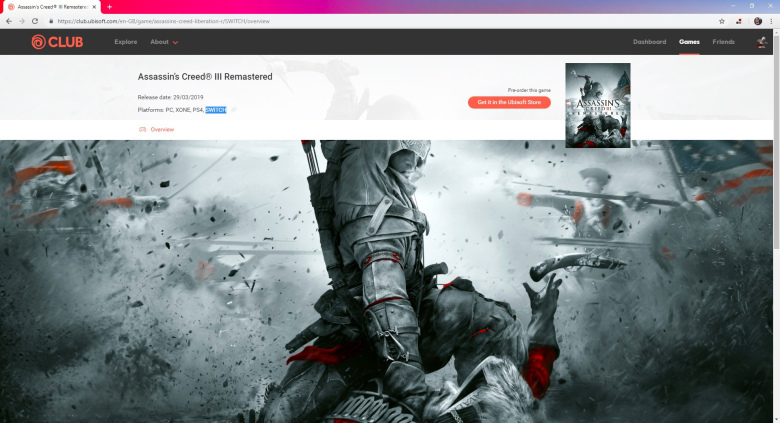 According to the official Assassin’s Creed III Remaster Ubisoft Club page, where players can earn rewards for playing their games, the Nintendo Switch is listed as a supported platform. No announcement of the game coming to Switch has been released as of this writing but, such a listing on a company run page is pretty indicative that the game is coming. Even still, treat this listing like any rumor until an official announcement comes down the pipe! Do you want Assassin’s Creed III on the Switch? Let us know below! Nintendo Announces LINK'S AWAKENING Remake And SUPER MARIO MAKER 2!